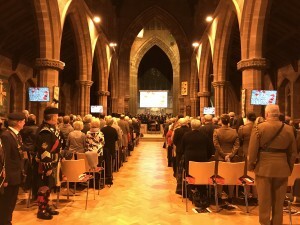 In November 2014 we held an event to commemorate the 100 year anniversary of the start of WW1. 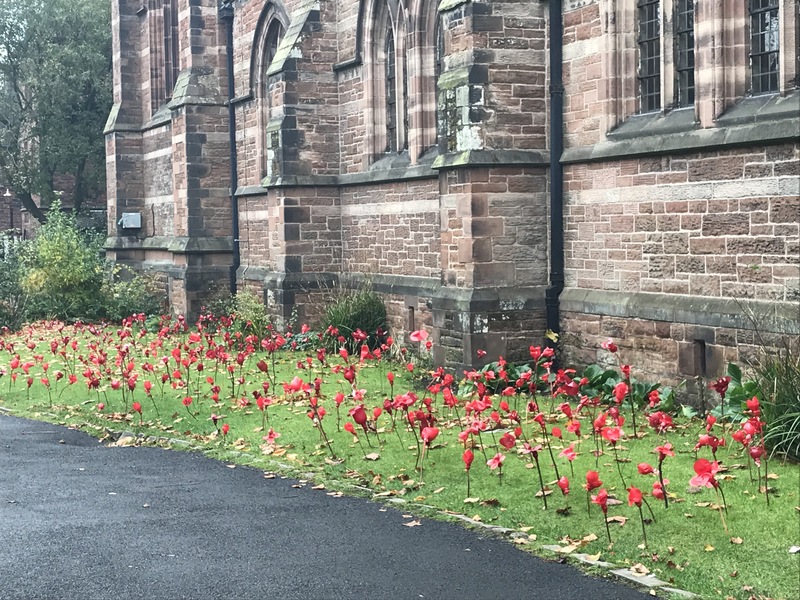 On Saturday 3rd November 4 years later the Mossley Hill Community commemorated the 100 year anniversary of the end of WW1. We were delighted to be able to welcome the Lord Lieutenant , the High Sheriff , Deputy Lord Mayor and our local Councillors as our guests . 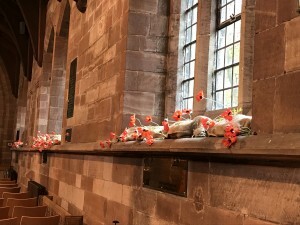 This was a Festival of Remembrance in church in which the community took part. 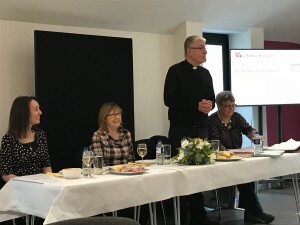 The evening was hosted by Alan Kennedy, our Team Rector and Annabelle Tiffin from the BBC. 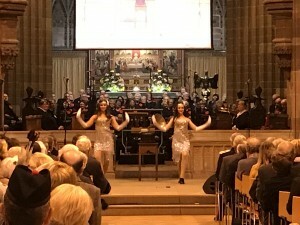 Dancers, Amber and Mia from Sophie Clark dance school who treated us to a Charleston, a dance from that time. The Liverpool College Mums choir, put together by Daniel Bishop their Director of Music, sang ‘When the fields are white with daisies’ which remembered the sadness of those whose husbands, brothers and sons did not return home. 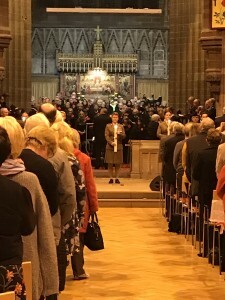 The song was made famous by Florrie Forde and the original music was arranged by Daniel for this occasion . 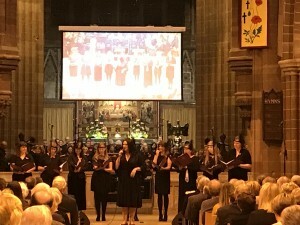 Lynn Dockerty who led us through a medley of more Florrie Forde songs from the time accompanied by Daniel Bishop and the Mums choir. 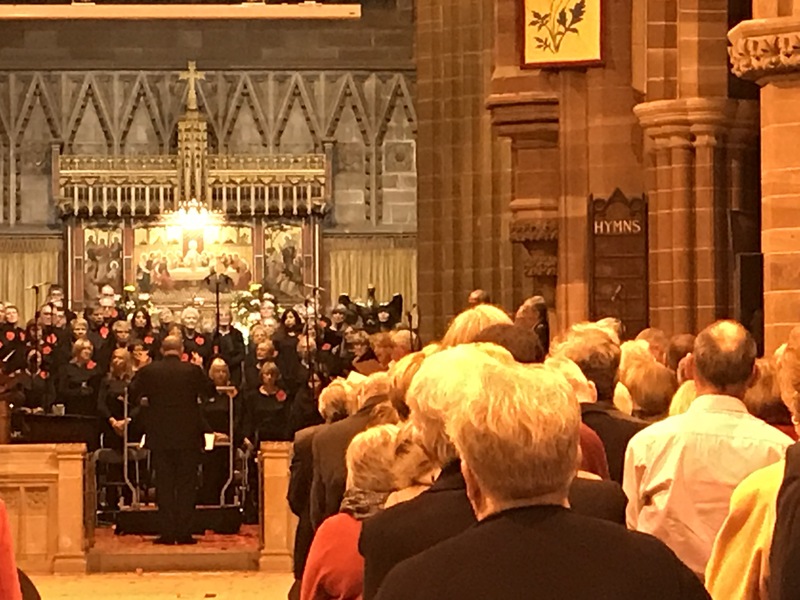 The Liverpool Welsh Choral who gave us two pieces, ‘Sure on this shining night’ and ‘Calon Lan’ and accompanied us with the community singing. Our Church choir and organist Colin Porter who sang a wonderful piece. The Liverpool College Drama department who staged a very poignant short drama which they had written which was inspired by one of the many families who lost sons, husbands and brothers in battle and the plight of women who were left behind. 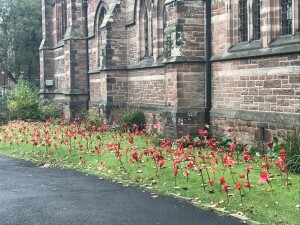 The College Art department also produced a public art installation ” To sleep with the Flowers of Red” on the church lawn, creating a field of red poppies from recycled plastic water bottles. David Bishop and Maggie Swinson were interviewed by Annabelle Tiffin about their respective relatives who served in World War One. A special part of the evening was when the flags were piped up to the front of church and there was a one minute silence while the flags were lowered. 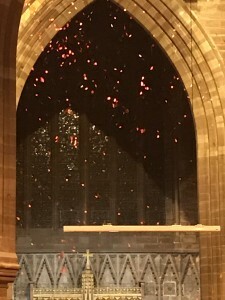 During this there was a very moving and poignant poppy drop from the Tower. 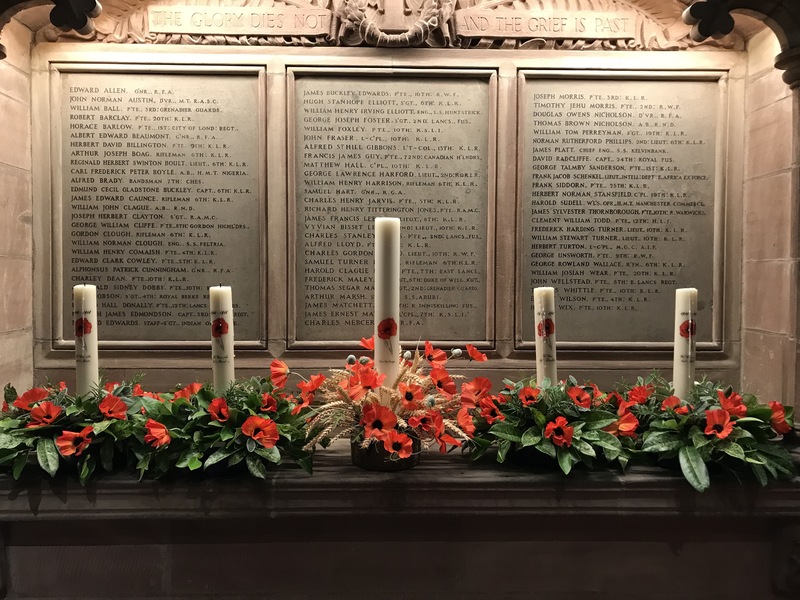 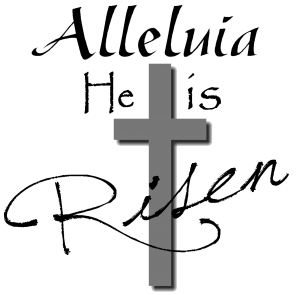 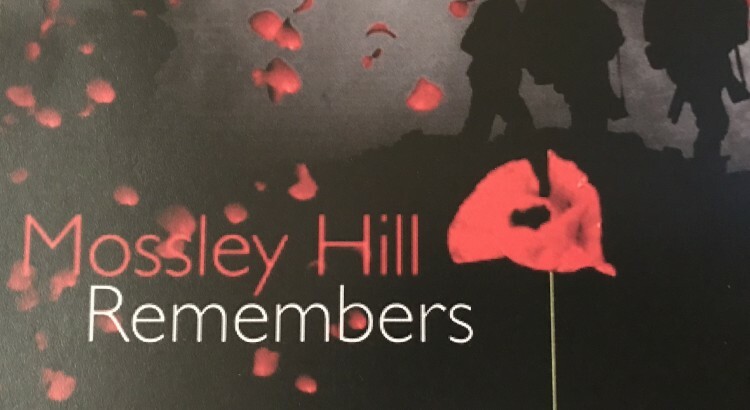 The Roll Call film was played in which people from the local community read out the names of those from the Mossley Hill area who lost their lives in WW1 and are named in our Memorial Chapel on the Roll of Honour. 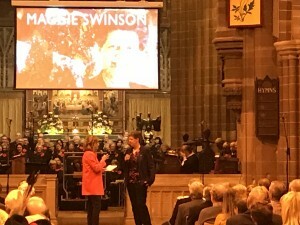 We thank the BBC for help with this film. 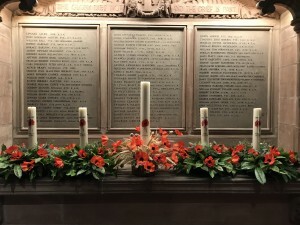 The Candle of Peace that had been extinguished 4 years earlier was relit and placed in the Memorial Chapel by a member of the Army. The evening came to a great finale with a flag waving enthusiastic rendition of Land of Hope and Glory by the whole Community. 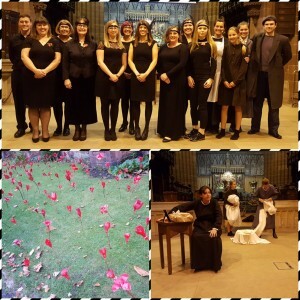 We are very grateful to all those who gave their time and efforts to make it such a fantastic evening.